United secured an important three points this afternoon after deservedly seeing off Queen of the South. An early opener from in-form Pavol Safranko during a dominant opening 45 minutes set them on their way before a late Michael Doyle own goal removed any late doubt regarding the outcome. The home side made the perfect start as they surged into a third minute lead via a familiar route. Fraser Aird took the ball on the right flank and after delivered a delightful hanging cross which Pavol Safranko headed home beyond Allan Martin after losing his marker. United went on to control possession with Aird at the centre of much of the sharp and inventive passing on display. In the 17th minute Paul McMullan sent in another early cross which this time Safranko headed just over. United controlled the first half, with most of the game being played in the opposition half, however the visiting defence were preventing any clear openings by keeping plenty of men behind the ball. There was sustained United pressure as half time approached and while it seemed the final through ball wasn’t far off, the hosts had to be content with a single goal lead going into the break. It was a more competitive affair following the break, first with King trying his luck from distance for the home side before Dobbie fired powerfully off target after beating Edjenguele to the ball on the right side of the box. Stewart Murdoch dragged his shot wide from a good position inside the area before another Dobbie effort won Queens a corner, taking a deflection off Fyvie. In the 63rd minute Safranko had a shot blocked for a corner before then being played through on goal only to be thwarted by an offside flag. The visitors clearest opening came in the 59th minute when a slip allowed Lyndon Dykes space in the box, however his weak shot was blocked for a corner by Siegrist. In the 72nd minute a lofted cross by McMullan was headed just wide of the target by sub Nicky Clark before the crucial second goal came with 10 minutes remaining. Queen of the South defender Michael Doyle made a hash of an attempted pass back to goalkeeper Martin, under pressure from McMullan. Not realising his goalkeeper had moved forward, the ball rolled beyond goalkeeper Martin and into the net, with McMullan taking the acclaim for his part in the incident. 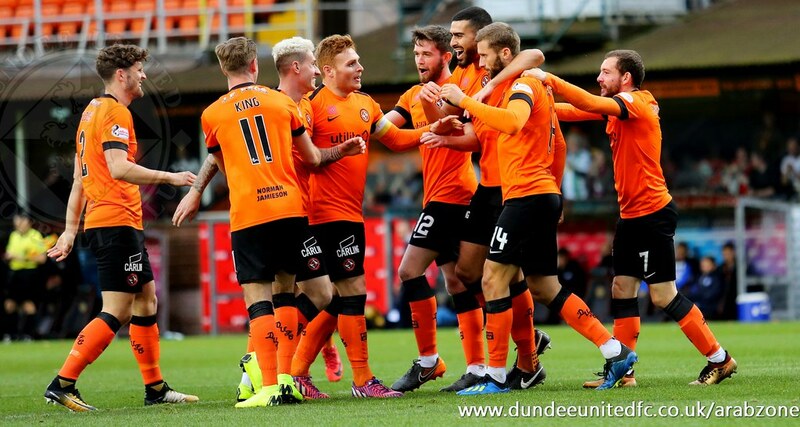 It settled the nerves for what may have otherwise been a nervy end to the game and secured an all important first win at Tannadice for Robbie Neilson and his players. It was a thoroughly merited victory and, after dominating the opening half through sharp passing and energy, the way the team dug in to secure the clean sheet will further boost confidence going into a huge match away to Ross County in a week's time. There were several contenders, particularly amongst the midfield and attack, however the most prominent throughout the 90 minutes was Paul McMullan, who seems to be benefitting greatly under the influence of Neilson. United: Siegrist, Murdoch, Booth (Barton 84) Edjenguele, McMullan, Fyvie, Stanton, Safranko (Curran 76), Bouhenna, Aird (Clark 58). Subs not used: Rakovan, Smith, Rabitsch, Loemba. Queen of the South: Martin, Mercer (Semple 51), Marshall, Fordyce, Doyle, Stirling (Harkins 73), Jacobs, Todd, Dobbie, Norman, Dykes. Subs not used: Leighfield, Murray, Bell, Ivison, Irving.